Our courses have been approved by the Kansas Mechanical Trades Review Board. 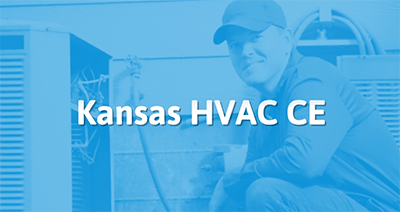 Take the continuing education to renew your KS HVAC license today. All of our courses can be completed At Your Pace Online to help you meet the state's requirements to maintain your license. Once you finish your class you will have an official certificate of completion to save for your records. Mechanical Licensees in Kansas must obtain Continuing Education to renew their license and stay up-to-date with new codes & systems in the industry. Since our courses are approved by the KS Mechanical Trades Review Board, they are accepted in the following jurisdictions. *Note: Johnson County, the City of Lawrence, Arkansas City, and Miami County do NOT accept online education at this time. This 6 hour course covers the significant changes to the 2012 UMC. Rather than look at the entire code book we will be focusing on the changes that were made to the 2009 edition in order to create the 2012 Uniform Mechanical Code. As much as possible, discussion of the changes includes reference to the 2009 code (if there is one), the new language or important points, and an explanation of why the change was made. It is best if the student has a copy of the 2012 UMC while taking the class. This 6-hour course has been designed to help a mechanical licensee meet their continuing education requirement for renewal. The course will review significant changes to the International Mechanical Code as it transitioned from the 2009 to 2012 edition. As much as possible, discussion of the changes includes reference to the 2009 code (if there is one), the new language or important points, and an explanation of why the change was made. It is helpful if the student has a copy of the 2012 UMC while taking the class (but definitely not required!). This 4-hour course is approved by the Kansas Mechanical Trades Review Board. Our class on changes to the 2012 Uniform Mechanical Code covers every significant change in Chapters 1-8 in the 2012 UMC. Rather than try to look at the entire book, however, we'll mainly look at what changes were made to the 2009 edition of the UMC in order to create the newest UMC edition for 2012. This three-hour safety training online education class for HVAC Contractors/Mechanics is based on OSHA regulations as well as recommendations by NIOSH, the EPA, and safety experts from private and non-profit organizations. The class is designed to be taken along with 6 hours of code changes and an additional 3 hours in elective content on Changes to the 2017 NEC for HVAC, also available from AYPO, or it can be taken on its own. This three hour course is approved by the Kansas Mechanical Trades Review Board and will review of the significant changes between the 2009 and 2012 IMC (International Mechanical Code). This 3-hour course is approved by the Kansas Mechanical Trades Review Board and will review the significant changes between the 2009 and 2012 IMC (International Mechanical Code). This three-hour class on Changes to the 2017 NEC for HVAC Contractors and Mechanics provides a solid introduction to how the NEC is applied, a review of a few key changes to Chapter 3 - Wiring Methods and Materials, and every significant change to Chapter 4 - Equipment for General Use that directly relates to HVAC. This 2 Hour course is approved by the Kansas Mechanical Trades Review Board. Our class on changes to the 2012 Uniform Mechanical Code covers every significant change in Chapters 9-11 in the 2012 UMC. Rather than try to look at the entire book, however, we'll mainly look at what changes were made to the 2009 edition of the UMC in order to create the newest UMC edition for 2012. This 2 Hour course is approved by the Kansas Mechanical Trades Review Board. Our class on changes to the 2012 Uniform Mechanical Code covers every significant change in Chapters 12-15 in the 2012 UMC. Rather than try to look at the entire book, however, we'll mainly look at what changes were made to the 2009 edition of the UMC in order to create the newest UMC edition for 2012.